"Is this a dead man, Doctor?" Very casually, the Enterprise travels back in time to the late 1960s to observe a crucial day in Earth history. A strange, long-distance transporter beam is intercepted and a man claiming to be a human, Gary Seven (Robert Lansing), raised on a distant planet, appears on the ship. He claims that he has a job to do that will avert catastrophe. Kirk must decided to allow him to do his work or not without knowing which is the correct course of action. 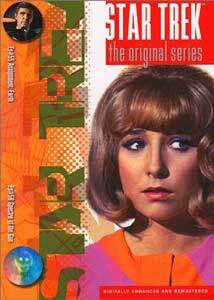 This episode is marked by a guest appearance as secretary Roberta Lincoln by Teri Garr. This show was mean as a pilot episode for what would have ostensibly been Seven and Lincoln as an Avengers-type duo, encountering strange forces; obviously, it never came off. Seven is also accompanied by his cat, Isis, who seems intelligent and a full partner in the adventure. As a show, the idea had interest and probably would have been no worse than much of the science fiction television of the era. However, as a Star Trek episode, there is a campy quality that seems to go outside the norm. The story is reasonably absorbing and suspenseful overall, but it is hard to get past the premise that the Enterprise has so blithely travelled in time. Usually, time travel on Star Trek bails them out of trouble. There is just something strange about those episodes where the crew ends up in "current day." This one does provide a little time capsule of America from the late '60s: even Roberta's little speech about how "I know this world needs help. That's why some of my generation are kind of crazy and rebels, you know? We wonder if we are going to be alive when we're thirty." Interesting that during the period that this episode was filmed, NASA was on the cusp of landing on the moon and orbital weapons platforms were a distant thought. This one has interest, but is not really a great Star Trek episode, so I give it two Enterprises. Fans of Robert Lansing will no doubt disagree. Like many of the lesser Star Trek episodes, this one still has elements of interest. Many of the cast of the show were veterans of the television Westerns of that era. Here is a retread of a the type of show where the crew encounters a advanced civilization and unknowingly trespasses somehow. The aliens punish them with some elaborate fantasy created from their memories. In this case, Kirk's fascination with the Old West is the source of the fantasy Tombstone, Arizona where he and his landing party find themselves. Kirk, Spock, McCoy, Scott and Chekhov become the Clanton gang and they are bound headlong to have it out with the Earps—Wyatt, Virgil and Morgan—along with Doc Holliday. There is a High Noon-ish quality as Kirk rushes around the town trying to convince the unconcerned people that they are not the Clantons. Many have indicated this as one of their least favorite episodes or point to it as representative of the derivative episodes in the latter part of the show's run. There are some good moments: Chekhov has a larger than usual part as Billy Clanton and does a good job as the eager Ensign. Scotty has several good moments, too. This ranks as another of those episodes that could be skipped in a collection of the best of Star Trek: The Original Series and I give it two Enterprises. Completists, however, must not avoid it. Image Transfer Review: The image transfers in the Star Trek collection are an impressive effort. The colors and skin tones are marvelous and, once again, I just enjoy looking at the Enterprise bridge and other interiors. There are minor defects and the unfortunate fact that the clarity of the image reveals the primitive nature of special effects in that era, but it is awfully good viewing. Audio Transfer Review: Another nice job on the audio. Very subtle expansion of the sound across the stereo spectrum provides depth without the artificial quality that over-processed sound can have. There were nicely done sound effects in the second episiode. We have mixed bag of episodes here. One is a pilot for another television show—of dubious quality—wrapped up into an adventure in which the Enterprise, quite casually, travells through time. The other is one of the most criticized episodes, as the landing party is banished to a re-creation of Tombstone, AZ, as the Clantons. This one is for completists only.